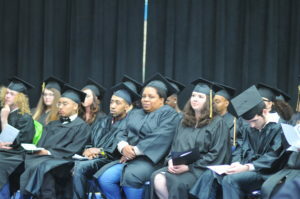 GED graduates listen to speeches given during the graduation ceremony. On Thursday, March 7th, family and friends gathered in Buncombe Street United Methodist Church while the graduates of the Adult Education GED program prepared for the evening. Students from the Beta Club at Eastside High School provided snacks and assisted guests during the wait. Graduates, meanwhile, tried on their robes, ate pizza and cake, and took pictures. Many of the graduates sat quietly in anticipation of a chance to publicly celebrate months of hard work and dedication–months of “climbing those stairs day after day and facing the things that were hard for [them],” as Program Manager Dr. Lisa Hall said in her remarks. Eventually, people filtered into the graduation hall and Executive Director Tony McDade welcomed everyone and gave the invocation. Then, Pomp and Circumstance began, and the procession of graduates made its way into the hall. Graduation at United Ministries celebrates everyone who graduates over the course of the year between each graduation. This year, there were 105 students who received their GEDs. 40 of those students were able to attend graduation and celebrate the occasion with their peers and loved ones. 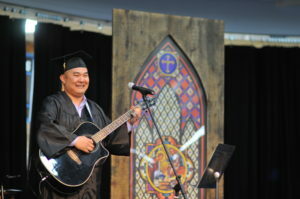 GED Graduate Young Ghun performing an original song as well as “The Rainbow Connection” for the celebration. Perhaps the biggest surprise of the night was the musical entertainment provided by Young Ghun, another graduate. In his introduction to his second song, he said that since he had gotten his GED and achieved one of his dreams, he figured that he would make the most of the night and achieve a second lifelong dream. That dream was singing a duet with a Muppet. Then, acoustic guitar in hand and a big smile on his face, he sang The Rainbow Connection while switching between his own voice and the voice of Kermit the Frog.